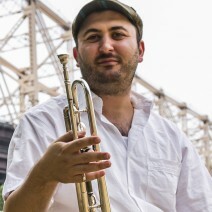 Trumpeter/composer Josh Deutsch has established himself as a versatile and unique voice on New York City’s contemporary music scene. leads the band Pannonia, whose debut album Another Time, Another Place is called “a well-planned, beautifully executed program” by Downbeat magazine, as well as the Josh Deutsch Quintet and a duo with guitarist Nico Soffiato. He has performed and recorded with Sofia Rei, Pedro Giraudo, The Hipstones and the Nathan Parker Smith Large Ensemble, and has played at many top venues including the Blue Note, Dizzy’s Club, The Stone, Birdland and the Jazz Gallery. Deutsch is an active music educator with experience teaching students and ensembles at all levels, and has appeared as a clinician and conducted master classes throughout the U.S. In addition to the New York Jazz Academy, Deutsch is on the faculty of the Queens College CPSM, the University of Oregon Summer Jazz Camp, and is a mentor with the Young Composer and Improviser Workshop, and the director of education of the Queens Jazz OverGround. A native of Seattle, Deutsch started playing piano and composing music at the age of five before discovering an affinity for the trumpet as a member of award-winning jazz bands at Washington Middle School and Garfield High School. He received a Bachelor’s Degree in Jazz Studies from the New England Conservatory of Music in Boston, where he studied with Danilo Pérez, Bob Brookmeyer, John McNeil, Allan Chase and composer Lee Hyla. A three-time participant at the Banff International Jazz Workshop, Deutsch worked closely there with Bill Frisell, Dave Douglas and Kenny Werner among others. In 2006, he was awarded a Graduate Teaching Fellowship from the University of Oregon from which he received a Masters of Music in Jazz Performance and Composition in 2009. He won the Reno International Jazz Festival’s Outstanding College Trumpeter award in 2008 and 2009 and is also a winner of a Downbeat Student Music Award as a College Jazz Soloist in 2008. For more about Josh, visit www.joshdeutsch.net.